October is Mental Health Month, a time dedicated to raising awareness about mental health and to making your mental health and wellbeing a priority in your life. Celebrate 2015 Mental Health Month with people from culturally and linguistically diverse (CALD) backgrounds! Come along to this free event and learn about the importance of looking after your mental health to ensure the maintenance of a balanced wellbeing. Download the flyer here or contact Su Kim on 9562 0549 or su.kim@sswahs.nsw.gov.au for more information and to register! 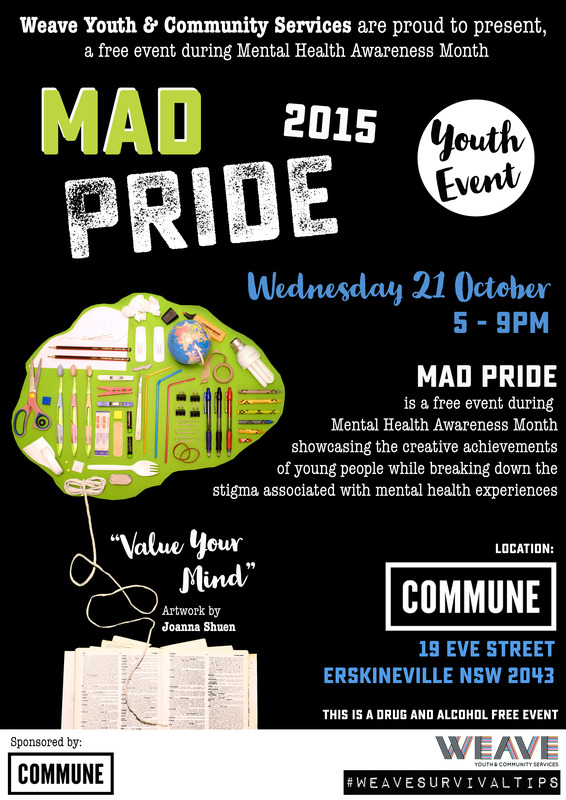 Mad Pride is a community and youth event held by WEAVE that aims to break down the stigma of mental health and show care our young people’s creative talents! The event will be held at the Commune in Erskineville and will be full of vibrant performances and art. Download the flyer here for more information and check out WEAVE’s website here! CAN is opening its doors and would love for you to visit and find out more about mental health. There will be free brochures and information, nibbles, and welcoming staff who will be happy to chat about mental wellness, what it means for you or what it means for your workforce. Blue Knot Day is ASCA (Adults Surviving Child Abuse)’s national awareness day celebrated in October every year, when ASCA asks local communities to unite in support of the 5 million Australian adult survivors of childhood trauma and abuse. This year’s Blue Knot Day theme is “supportive communities help survivors recover”. Check our the Blue Knot Day website and ASCA’s Facebook page for more information!